Disc Four: Where are you? These four CDs contain seven complete LPs and cover the period 1958 TO 1959 except fot the album “The Bridge” which is the first album recorded after his return from his sabbatical in 1962. All the albums are fairly well known except for “The Sonny Rollins Trio in Sweden 1959” which were released on the Indigo label and “ Sonny Rollins Aix-en-Provence 1959” released on the Royal Jazz label. CD One opens with the album “The Freedom Suite” which is just short of twenty minutes long, the balance of the album is made op of four standard songs. The themes of the standards are treated starkly until Rollins launches into his improvisation, Oscar Pettiford on bass and Max Roach on drums provide sympathetic support, Max Roach is incisive without being intrusive. The ballad “Till there was you” is treated with tenderness without resorting to romanticism. . The long “Freedom Suite” finds Rollins in full flow with Pettiford and Roach assisting and contributing fully to Rollin‘s performance..
being the unaccompanied solo “Body and soul”. This is possibly the first time the Rollins Music Inn recordings have appeared in their complete form and what a delight they are with John Lewis and his Modern Jazz Quartet stars providing superb backing. Rollins own composition “Doxy” opens the set and Rollins is in masterly form and the backing trio are like a well oiled machine in their support. Rodgers and Hart’s “You are too beautiful” is a master class in how to play a ballad. The two tracks which originally appeared on the Atlantic label have Milt Jackson added to the line up and the interplay between Jackson and Rollins is as good as it gets. 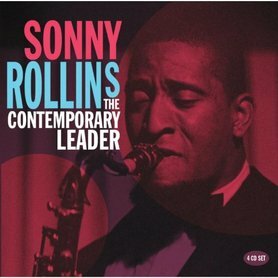 “Sonny Rollins and the Contemporary Leaders” Rollins with an interesting choice of material who would have thought that’s songs like “I’ve Told Every Little Star” and “Rock-A-Bye Your Baby” would be suitable material for a jazz performance but Rollins thrives on this type of tune. With an over romantic song like “In The Chapel In The Moonlight” in Rollins hands it sounds like one of the great ballads of all time. The all-star group are impeccable with outstanding solos from Barney Kessel and Hampton Hawes and Leroy Vinnegar and Shelly Manne are faultless in their accompaniment. “Sonny Rollins Trio in Sweden” was originally recorded for Swedish radio and inferior recordings were issued by small labels but the tracks sound fine on this issue and fill a small gap in rollins recording career. The album “Sonny Rollins Aix-En-Provence 1959” consists of three long tracks and Rollins is in full flow spurred on by the ground breaking bop drummer Kenny Clarke. Rollins is plumbing the depths and obviously searching for perfection, this could possibly be the reason for his long sabbatical. On return from his self imposed exile from the scene “The Bridge was his first return to the recording studio and he has still dispensed with the inclusion of a piano in the group. It is the guitarist Jim Hall who joins bassist Bob Cranshaw and drummer Ben Riley in the group. There is no discernible change in Rollins style except for a slight softening of tone but his approach to ballads is as fluent as ever as he demonstrates on “God Bless the Child”. and “Where are You”. “John S.” and “The Bridge” are typical Rollins compositions. This release is welcome return for Rollins to the recording scene. If you are a Rollins fan or of the tenor saxophone this is a splendid document covering an important period in Rollins career and also a feast of modern tenor playing. Not to be missed.